Photographer Bryan Meltz, whose work on the aftermath of the Haitian earthquake has been featured in an exhibition on display in Emory University’s Woodruff Library, now has a book of photos based on the exhibit. “AFTER: Images from Haiti” is being published by Meltz and The Global Initiative for the Advancement of Nutritional Therapy (GIANT), a nonprofit organization based in Tucker, Ga., that Meltz has been collaborating with in Haiti. The book will be sold at the AJC Decatur Book Festival Sept. 3-4, at the Emory Libraries booth (corner of East Ponce de Leon Road and Clairemont Avenue). Proceeds from book purchases will be donated to fund GIANT’s ongoing work in Haiti. Meltz’s exhibition, featuring a rotating series of photos she took during multiple trips to Haiti after the January 2010 earthquake, remains on display at Woodruff Library through Sept. 9 outside the library’s ECIT classrooms on Level 2. As the photos are rotated out, they are put on display at the Grace Crum Rollins Building on the plaza level of the Rollins Public School of Health, where they will continue to be on display after Sept. 9. 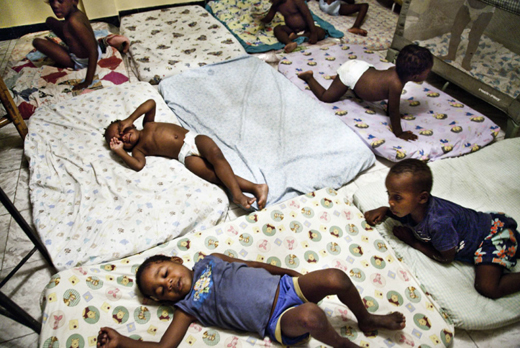 Children get ready for bed at His Home orphanage in Port au Prince. More photos from the collection. An Atlanta-based documentary photographer and a staff photographer with Emory Photo/Video, Meltz’s images from Haiti also received a bronze award from the Council for Advancement and Support of Education in the Photographer of the Year category in the 2011 Circle of Excellence Awards Program.